The Second World War began in August 1939 on the edge of Manchuria and ended there exactly six years later with the Soviet invasion of northern China. The war in Europe appeared completely divorced from the war in the Pacific and China, and yet events on opposite sides of the world had profound effects. Using the most up-to-date scholarship and research, Beevor assembles the whole picture in a gripping narrative that extends from the North Atlantic to the South Pacific and from the snowbound steppe to the North African Desert. 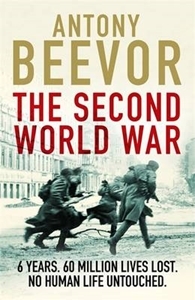 Although filling the broadest canvas on a heroic scale, Beevor's THE SECOND WORLD WAR never loses sight of the fate of the ordinary soldiers and civilians whose lives were crushed by the titanic forces unleashed in this, the most terrible war in history.